Modern science do not have complete knowledge on types of body a person gets or enters into, when he or she take birth in this world. Today’s kaliyugi science simply suggest to take care of mind and body, in a way, advocating involvement to worldly things and spend money around other developments of science. 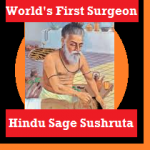 The main reason why modern science fails but Hindu Science excels is; modern science only research and deals with human body while Hindu science deals with body, mind, consciousness, nature and co-relation of our presence with the Supreme being who controls everything within or external to us. 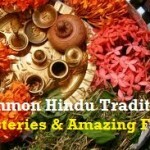 Hindu Science is based on Vedic principles taught by Rishis since several thousands of years. Sarira is Hindu term for the body, the physical self. According to the “Doctrine of the Three bodies” in the Vedanta, the human being comprises three Sariras or “bodies” – 1) Sthula sarira, the Gross body; 2) Suksma sarira, the Subtle body, and 3) Karana sarira, the Causal body. The Sthula sarira is the Annamaya Kosha, the Suksma sarira comprises Pranamaya Kosha (Vital breath or Energy), Manomaya Kosha (Mind) and the Vijnanamaya Kosha (Intellect) and the Karana sarira is the Anandamaya Kosha (Bliss). Karana sarira is the cause of Sthula sarira and Suksma sarira. The seven bodies or levels of existence include Sthula sarira and Linga sarira. 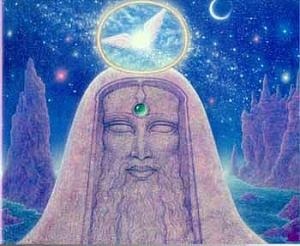 Hinduism describes that the non-liberated soul are born (jiv) in “Mrutyu Lok” – the realm of the universe where life exists. 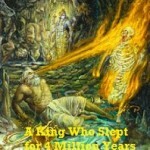 They born, live, and die in this realm (lok), so, it is called Mrutyu (death) lok. Scientists have found that life can sustain even in the most extreme or harsh conditions. This is because of the superb structural and functional engineering of the body. Thus, body is an important unit of living being. In Hinduism, body is known as sharir, deh, tanu, or tan (ta´n). 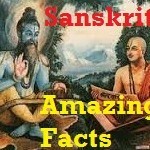 The Sanskrit word “tan (ta´n)” rhymes with man (ma´n means mind) and dhan (dha´n means prosperity or wealth). Middle Persian language (3rd to 7th century BCE) also used to have Sanskrit word tan (ta´n) for the body. Hinduism describes all living beings have three kinds of body, namely, Sthul (gross), Sukshma (subtle or psychological), and Karan (causal). 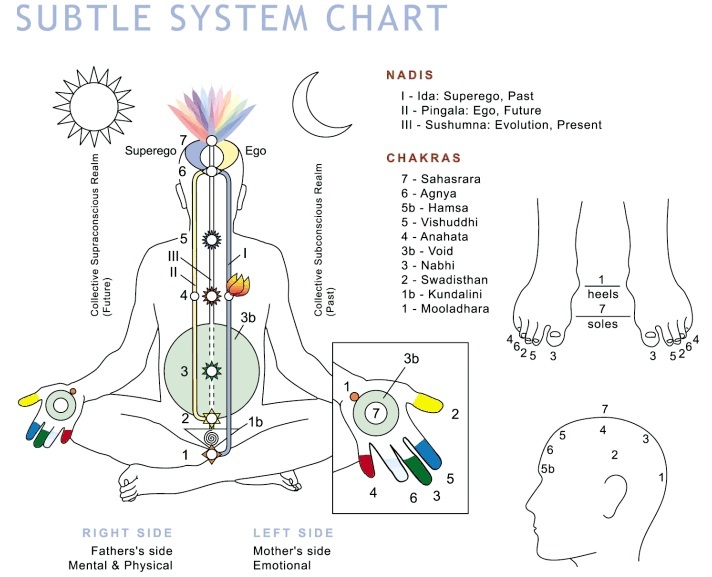 This body of living beings is consisting of 24 physical entities, called tattvas. 1. Sthul sharir: It is a gross physical body of the soul or jiv. Sthul body is made of different parts and organ systems called “Ang” and “Upāng” in Sanskrit. For the lower animals and microbes, their gross body is microscopic and they have tiny angs and upangs. Out of 24 elements, the sthul body of living beings consists of five gross elements known as Panch-bhuts. They are: Pruthvi, Jal, Tej, Vayu, and Akash. These five bhuts are created from Tāmas Ahamkār, which in turn is created, along with Rājas and Sātvik Ahamkārs, from Mahattattva. Mahattattva, which is equivalent to Chitt, is the primordial element of the body. Sthul sharir is perceptible by our five senses. According to Hinduism, an important function or the main purpose of Sthul sharir is to gain the ultimate knowledge of the Truth, to enjoy the bliss of God and God related spiritual pleasure in this very life, and to transcend to the abode of God after the death. But because of its nature of experiencing happiness and sorrow of panch-vishays it has become an object or vehicle for Bhog-vilās (worldly pleasures) causing more attachments to them, instead of achieving moksh, detaching from worldly pleasures, or achieving the highest spiritually enlightened state. 2. 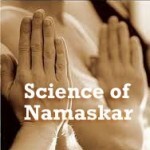 Sukshma sharir: It is subtle, psychological or functional body. 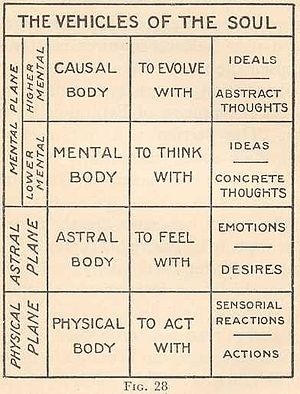 For higher animals it is psyche or mental body for the soul. It is not perceptible by our senses or sensory organs but its existence can be inferred and experienced in our day to day life. For the lower animals and plants sukshma sharir is functional and can be understood by their intelligence and activities related to survival and feeling of pleasure and pain, such as, food gathering, cell division and multiplication, mating, hibernation, running away from danger and developing bodily resistance against harsh environment, experiencing shock, sadness, crying, etc. Sukshma sharir carries with it the basic instincts for the protection and survival of a living organism, such as āhār (to eat food), nindrā (to sleep), bhay (to fear), maithun (to procreate), sukh (to feel pleasure), and dukh (to feel plain). In the modern time of luxuries we still feel unhappiness in our life. In the modern time of comfort we still feel that our world’s peace is at stake. This is because we are still harboring, in our sukshma sharir, the vices, such as, lust (kām), avarice (vāsanā), anger (krodh), greed (lobh), egotism (mad), infatuation (moh), jealousy (irshā), enviousness (matsar), hope (āshā), deep and intense desire or crave (ishnā, trishnā or trushnā), grudge or animosity (ver), etc. We create our own mental body around us. For example, a person of one race, with a name, with a nationality, with specific skin color, with certain qualifications, with mutual social and monetary status, and a creed. I am doctor, engineer, actor, or businessmen, etc. I am rich or poor. I am brother or sister, father or mother, uncle or aunt, etc. Even animals, tiny creatures, and microscopic organisms also create their own such mental (sukshma) body around their soul and that is why they recognize their kind and also stay, mingle, and mate with their kinds. When we call an animal by its name it will look at us and respond, because, the animal has created a mental body around its soul. Our sexual orientation, irrespective of our chromosomal, hormonal, or physical orientation is the result of our mental (sukshma) body. A common person may think of himself as a king and a king may think of himself as a common person and behave accordingly because of his sukshma body. Sukshma sharir consists of rest of the 19 elements, namely, five Prāns, Vishays, or Tanmatras; ten Indriyas, four Antahkarans, namely, Man, Buddhi, Chitt, and Ahamkar. 3. Kāran sharir: Hinduism has described Kāran sharir around our soul. It seems to be, the karan sharir of the soul has not been described before by any other religion except Hinduism. Kāran sharir is a causal body which is the sole cause for the gross and subtle bodies in the next birth of the soul that is not liberated or detached from the causal body. Causal body carries the information or knowledge acquired during the previous births. The infatuation and intense or deep desires for the worldly objects and pleasures, called vāsanā, goes along with it. Soul is firmly attached to this causal body or kāran sharir. Kāran sharir consists elementally of Māyā, so it has all the characteristics of Māyā. It is described to have attributes like, anādi (without the beginning and end), avidyā (ignorant in nature), and anirvāchya (indescribable or inexplicable). On death the sthul and sukshma bodies become “dust unto dust” or parts of natural physical elements. But the causal body or kāran sharir, after death, goes with the non-liberated soul (māyānvit meaning covered with maya) wherever the soul goes, unless, the soul is completely detached or freed from it. Once the soul is completely detached from its causal body made of Māyā, it goes to the abode of God called Brahmdhām. This liberation of the soul is known, in Hinduism, as final redemption or “Ātyantik moksh”. Thus, final redemption in Hinduism is the detachment of soul from its three bodies consisting of maya and its attributes. It also means liberation forever from the cycle of birth and death, also known as Samsār chakra, because the soul has never have to come back to world again except for the God’s wish. It is internal resource that co-exists with the external sources of the Bhumandala from Vedas. A proper understanding of the word, Anātman, cannot be had without the proper understanding of the Upanishadic concept of the Atman. The Vedic seers had long ago realised that the Atman is Brahman. They had realised the universal truth – ayam atman Brahman – that the Jiva, the individual soul, is not merely a part of Brahman, the Universal or Cosmic Soul, the Jiva is Brahman itself. Therefore, Adi Shankara in his Vivekachudamani explains – “I am the body”, thus thinks a foolish man. A man of mere book-knowledge considers himself to be a combination of the body and the Jiva. But the realised sage, because of his discrimination, knows that “I am Brahman”, and looks upon the eternal Atman as his Self, And, explaining thus, instructs – “Just as you would not identify yourself with your shadow, your reflection, your dream-body or the body in your heart’s imagination, so too, you should not identify yourself with your living body.” Also meaning thereby that all human beings can aspire to be liberated, and Self-realisation is possible during one’s own life-span; one need not wait for death to achieve this objective. According to the Upanishads the world phenomena is a creation of Brahman, a manifestation of Brahman who after creating the world created first the intermediary Virat subsisting between Itself and the Universe, created the couple Rayim and Prana i.e. Food and Prana, to produce in multifarious ways creatures that are impelled by Consciousness. Sandilya, the metaphysical philosopher of the Chandogya Upanishad, provides to us the cosmological proof of the Absolute which he calls Tajjalan – Sarvam khaluidam Brahman tajjalaaniti shaant upaasite – “All this (collectively) is Brahman, indeed: what evolves from That, what dissolves in That, what breathes or functions in That, should be closely and calmly studied…….” Thus, to the Vedic seers, Brahman, having all consciousness factors and all non-consciousness factors in abundance, appears as the mind, has prana as the body, and has the form of consciousness; constitutionally Brahman is – Mind, Life, Light (that which illuminates or reveals), Prana-sarira, Satya-sankalpah, etc. From Brahman emanate all organs, all worlds, all gods and all beings. Therefore, cosmologically, Brahman is the subtle essence that underlies phenomena, biologically, it is the supreme life-principle that gives life to the universe and psychologically, it annihilates all individualities. As Ishwara Brahman controls the sentient and the insentient, both. The world exists in time and space governed by causality. Because volition exercising Consciousness and its creation are both identical and there is one non-dual Pure Consciousness only, Adi Shankara concludes that this world of manifoldness is unreal i.e. Mithya, which is the wrong attribution of the qualities of the non-consciousness factor to the consciousness factor. This false attribution of the true concept of one to that of another i.e. false super-imposition, which is an eternal process, is called Adhyasa by Adi Shankara. This super-imposition is called Ignorance. But, Ignorance is not want of knowledge. Super-imposition is the apparent presentation to consciousness, by way of remembrance, of something previously observed in some other thing; it is illusory knowledge. Texts are based on this false super-imposition. Direct perception as well as the Shastras are part of Avidya, the world of duality fashioned by Maya. 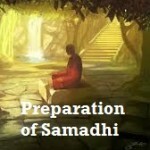 The object of Vedanta is to clarify the misconception that direct perception and Maya are real. The knower who has attained self-identification with the body, mind and senses etc., for him all means of knowledge become irrelevant. From the standpoint of the Absolute Adi Shankara regards the world as a false appearance while recognizing its empirical reality and denying its ontological reality. Shiv and Hari both are same. Shiv Bhakti is done with Shivaite tradition (Shaivism) and Haribhakti with Vaishanavite tradition (Vaishnavism). You can pray either of them very dearly. The best part about praying merciful Krishn is you can think of him as a friend, child or brother – this freedom is not there in case of other Vedic gods. Though devout Hindus do consider their Gods as either of them. We are of the view to have traditional approach sticking to our pious culture. 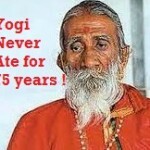 Muslim babas, fakir and peers have caused immense damage to Hindu society and country. We cannot support further glorification of anti-Vedic rituals – we natives of Bharat are facing these since last 1200 years. Enough of allurement and appeasement. Glorification of anti-gods like sainath convey wrong message – indirectly allure Hindus into anti-Vedic folds, such people are more prone to leave Hinduism for terrorism cults like islam. Its better to call spade upfront. When you follow the path of Dharma, you cannot be in two minds – either you are with the Dharma or proponent of anti-dharmic rituals. in total agreement with Subrat prabhu.clears confusion and establishes position of Krishna as Absolute. 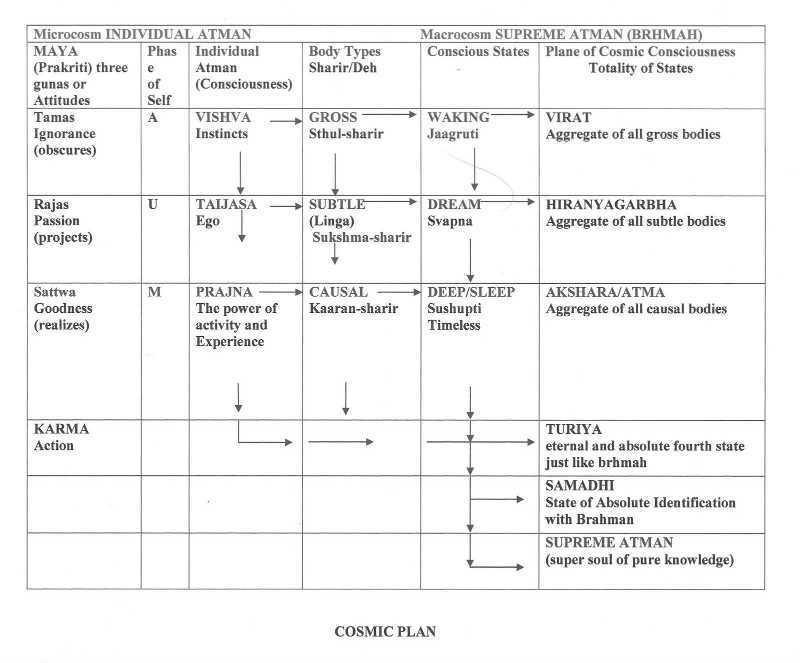 Bro..the later part of your article where you describe Atman is not at all pleasing. I get a smell of Shankara’s Advaita Vada or Maya Vada from it. ….”that the Jiva, the individual soul, is not merely a part of Brahman, the Universal or Cosmic Soul, the Jiva is Brahman”……..
BG declares that Jiva is a separated part (VibhinAmsa) of Krishna and is eternal (SanAtanah) (BG 15/7). By this, Krishna declares that His Divine Self is twofold (I) Associated Part (SvAmsa) and (II) separated part (VibhinAmsa). As SvAmsa, He descends as Avataras, The principle of His Supreme Lordship fully exists in His Associated Parts (SvAmsa) but not in His separated parts (VibhinAmsa), over whom a separate individual egotism (Krishna DAsatva) prevails. “Jiver swaroop haya Krishner Nitya Dasa, Krishner Tatastha Shakti BhedAbheda Prakasha”. So Jiva is Krishna’s Tatastha Shakti (BG 7/5) and Krishna Bhakti is the Eternal function of Jivas even after the emancipation. Moksha is not the final redemption. Although Jiva is not material and not Independent of Krishna and in that sense Vedanta declare Jiva as non-different from Brahman (Shakti Shaktimaoh abhedah), but Jiva is not the Brahman. The term Brahman in Vedanta only refers to Krishna or Vishnu, not any abstract nirvishesha principle. There is a scarcity of Chaitanya Mahaprabhu’s Achintya BhedAbheda Siddhanta in your article. I don’t expect this kind explanation devoid of Bhakti in your article. After deep researching Vedas and Puranas, we get several instances where the debate of Vaishnav and Advait looks farcical. And we found with the blessings of Shree Krishna that Shree Krishna is same as Shiv and Shiv is not different from Krishna, they take different forms for their bhakts and type of bhakti they prefer. Advait show Shiv superior Bhagwan while Vaishnav believe Krishna as Supreme being. It is out of their deep love which sometimes crosses the line of dvesh and ahankar. We keep our interpretations open to Vedic texts which include Yuga incarnations, Purans, Mahabharat, Shreemad Bhagwatam, Bhagavad Geeta and Ramayan. Only limiting to viewpoints of Bhagavad Geeta would mean discrediting knowledge which is bestowed by Shree Krishna himself in Shiv form. 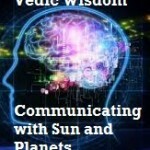 Understanding knowledge of Vedas is not demeaning teachings of Shreemad Bhagavad Geeta because Vedic texts are compiled by Vishnuavatar of Krishna, Ved Vyas. And yes we strongly believe words of Shreemad Bhagavad Geeta as statements made by Shree Krishna for all of us. We also believe the concept of Shiv Aham which means we can become Shiv too with hardest of penances and Tapasya. The dvesh and ahankar in bhakti is not liked by Shree Krishna himself. Let us be open to the best of the thoughts of our Vedic culture. It only enriches our body and soul. Bhagwan does sacrifice many things for us, infact the Universe, center of Universe- our Earth, heaven, nature, elements and time/space revolve around Manu, It is only human body (not even Devtas/Asuras) which can travel through each one of these and attain Moksha. We are very fortunate to take birth on Earth as humans after billions of rebirths – more fortunate than Devtas themselves. And Bhagwan can revoke Moksha state as and when it is required. But that takes several kalp years to happen, which cannot be numerically calculated by us. Lets us all utilize the life to gain complete knowledge to perform Karmas. Truth is not farcical, whatever attempt you may make to explain it through your own way; truth remains truth. Approaching truth is not dvesh and ahankar. In your other article you have written…… “Bhagwan Vishnu and Bhagwan Shiv are same. 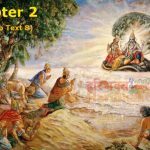 HariBhakt Srila Prabhupada explains in his purport how Bhagwan Vishnu acts through Bhagwan Shiv in the creation of the material world. Bhagwan Shiv acts on behalf of Bhagwan Vishnu. When the Bhagwan says in Bhagavad-gita (14.4) that He is the father of all living entities (aham bija-pradah pita), this refers to actions performed by Bhagwan Vishnu through Bhagwan Shiv. Bhagwan Vishnu is always unattached to material activities, and when material activities are to be performed, Bhagwan Vishnu performs them through Bhagwan Shiv.”….. Here you clearly mentioned that Shiv is Hari Bhakt, a Vaishnav, JagatGuru. Bhakti, Bhakta and Bhagavan are eternal. Through the grace of Shiv, one can get Krishna Bhakti. Through the grace of a Bhakt (Guru), one get entry into the Sadhana Bhakti under the guidance of the Bhakt (Guru), to get Sadhya Bhakti (Krishna Prema), still under the guidance of Bhakt (Guru). So Bhakti, Bhakt and Bhagavan are Eternal and at no stage one can throughout Bhakt or Bhagavan from their seat and grab their places. Then how can one become Shiv with a so-called concept of Shiv Aham? The very term Shiv Aham is itself false. No one can become Shiv. This is not Bhakti but a charade, imitation to kill your object of worship (Shiv) and take his seat to enjoy the material creation and fall prey to Maya again and again. Only limiting to viewpoints of Bhagavad Geeta would mean discrediting knowledge of other scriptures???? Upanishads, Brahma-sutra, Bhagavad Geeta, Puranas and Srimad Bhagavatam, the highest and real explanatory scripture of Vedanta have same meaning, same viewpoint and same goal. Jiva is Krishna Dasa, Krishna Bhakti is the Eternal function of unadulterated stage of all Jivas, and Krishna Prema is the Final and Ultimate Aim. Through the grace of Bhakta (Shiv) and Bhagavan (Krishna) one get entry into Bhakti. The origin of Shiv and the meaning of Ling-Yoni is explained here. 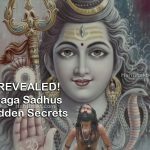 The real nature of Shiv is being explained here. These verses of Brahma Samhita are explanation of Bhagavad Geeta 14.4 narrated by you in your other article. Though Shiv is not a Jiva, but is VibhinAmsa-gata, not a SvAmsa. Krishna or Vishnu is the Vishaya-vigraha and Shiv is the Ashraya-vigraha. Krishna is Sevya and Shiv is the Sevaka. Krishna is Bhagavan and Shiv is Bhakt, Krishna is the Avatari and Shiv is GunAvatara. Bhagwan Vishnu in the form of Shree Ram prays to Shiv Ling in Rameshwaram. While Bhagwan Shiv in the form of Rudra Avatar Hanuman prays to Shree Ram. Shiv Puran suggests Shiv is the Supreme soul while Bhagwat Puran informs Vishnu is the greatest of all. Shiv Bhagwan and Vishnu Bhagwan are one and the same representing two different forms of Bhakti. There is no upmanship here, they mutually respect each other. And expects their bhakts to behave similarly. Whatever you mentioned is true however solely depending on the Vaishnavi text, while we are suggesting to be open to all texts. We completely agree with all texts (not only on interpretations) and spiritual information provided in them. when Bhagwan Krishna wanted to bring Kalpa Vriksha from Indra, he worshiped Bhagwan Shiv for blessings and that is known as “Gopeshwara Mahadeva” in Vrindavana means Ishwara (God) of Gopal(Krishna). However Gopeshwar is also the form of Gop (Bhakt of Shree Krishna – its not paradox but incidence of mutual respect). Again when Krishna wanted to have a son, he asked sages for their advice, who suggested him to pray Bhagwan Shiv to get a son. If Krishna was Vishnu against whose will nothing happens, why he said that “Shive Sarvadhi Sadhike” means nothing happens without Shiv’s will, so please bless me with a son! when the Mahabharat war was about to start, he asked Pandavas to have blessings of Bhagwan Shiv first and arranged a Pooja of Shiva Lingam. Similarly, to have darshan of Baby Krishna, Shiv convinced hard to Maa Yashoda to let him have this darshan, as he wanted to see his beloved Bhagwan. Moreover, the Rudra Avatar of Shiv, Hanuman, is such a great Bhakt of Vishnu Avatar, Shree Ram, that he will be protecting the name of Shree Ram in the Kaliyug (to negate the diminishing impact of Dharma), till the start of Satyug. There are numerous incidences where we find Shiv Bhagwan and Vishnu Bhagwan mutually respecting each other. And their Bhakts should not argue on the modes of Bhakti Paths they take to reach Supreme Soul. For all of us, they are one and same. No one is superior to the other. Tasmaat parataram devi tadiyanam samarchanam”……… meaning, amongst all Aradhanas, Vishnu Aradhana is the Highest. Serving devotees of Vishnu is higher than that. You mentioned about Shiv Purana. All Puranas are not perfect. There are Tamasika, Rajasika and Sattwika Puranas to suit different types of people. But different types of people with different moods, doesn’t mean that there are different ways to approach dharma. Dharma cannot be many. Dharmam tu sakshyat Bhagavat pranitam (Srimad Bhagavat). Dharma which is enjoined by Bhagavan is the only Dharma. Apart from that all are Adharmas. In other words BhAgavat Dharma is the only Dharma. Dharmas enjoined by different types of people according to their different moods cannot be called as Dharma or as different ways to reach the SO CALLED same goal, as we listen “jatah matah tatah patha”. This is simply non-sense. Different types Puranas are there only to bring Tamasik, Rajasik people to Sattwik and finally to nirguna or Visuddha-sattwa. Srimad Bhagavat is nirguna. It is enjoined at the start of the creation in the heart of Brahma by Krishna. (Chatuh sloki Bhagavat). After writing so many Puranas, Vyasa deva was still disgraced and unhappy. His Guru Narada Muni told him that he has not yet disclosed the complete Bhagavat Dharma in any of the Puranas. And then by the grace of his Guru, he started writing Srimad Bhagavat which was previously enjoined into Brahma. So Srimad Bhagavat is the only Pure and Nirguna Purana unlike other Puranas. And Bhagavad Geeta is the direct word of Krishna. So any other Puranas have value if it is obedient to Srimad Bhagavat or Bhagavd Geeta, else it is of no worth. Let me go back to Vedas. It is written in Rig Veda Brahmana—“Agnirvai devanambamo Vishnuh paramastadantara anya devatah”…………. Meaning, Vishnu is Parameswara, other Devatas are in middle and Agni is lowest”. This is one mantra amongst many like this in Vedas. There are 33 demigods described in Vedas, but Vedas declare that Vishnu is the Highest Tattwa, nothing is higher than Him and all other Devas are subservient to Him. Where Vedas directly declare this, what to tell about other scriptures? You mentioned about Gopeswar Mahadev, Shiv himself wanted to serve Krishna in Gokul and stayed there. Gopis worshipped Gopeswar Mahadev to attain Krishna Bhakti and serve Krishna in Rasa Lila. They didn’t worship Shiv as an independent god and attain the so called Shiv Aham or merge into the abstract Brahman. It is found in Srimad Bhagavat that Pracheta’s under the guidance of Shiv, served Sankarshana, the Lord of Shiv. They did not try to become Shiv (Shiv Aham) or tried to become Sankarshana. The question of mutual respect comes when there are two independent beings and for harmony they have to respect each other. Krishna and Shiv are not two independent gods. Shiv is not a Svatntra Iswara. As you yourself mentioned earlier, Mahavishnu is always associates with His Chit Shakti (RamA) and doesn’t associate with Maya (opposite of Chit Shakti) directly for creation process. He glares a Glance from a distance on Maya and that Glance or Halo or Jyouti or Ling is Shiv. In other words, Mahavishnu incarnates Himself as Shiv to associate with Maya for creation. But this Avatar (Guna Avatar of Vishnu) is not a SvAmsa Avatar of Vishnu like other Leela Avatars. It is a VibhinAmsa Avatar, for which Shiv is Ashraya Vigraha and subservient to Vishnu. Upanishads declare, Ekam eva dvitiam. There is not a second, apart from the One. So how can there be two aspects of Godhead as Krishna and Shiv for which there will arise the case of mutuality???? So where is the catch? 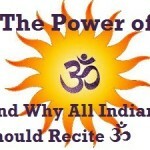 The catch is here –when you write, there are two Bhakti paths with Krishna Bhakti and Shiv Bhakti to reach Super Soul. As part of Adaita Vada, if you write that the Absolute is Formless, Nirvishesha, devoid of Potency, Niscriya, Abstract Principle, then you are highly mistaken. According to Vaishna Acharyas, It is merely misinterpretation of Vedanta. Absolute is associated Achintya Shakti. It is in His Identity itself. He has Chit Potency and Has Divine Sachidananda , Anandamaya Swaroop and Bhakti is the essence of Ananda which is the Eternal Function of all Jivas. That Divine is one and only one who is Shree Krishna. As the Divine cannot be two, then how could there be two Bhakti paths???? Bhakti is the only path and refers Shree Krishna only, no other deity. The final emancipation of Vaishnavas is not that Super Soul or so called Nirvishesha Brahman as you mentioned or not any Shiv Aham, but only Pure Bhakti, which is the Eternal Function and Aim of all Jivas, forgetting which they became Maya Baddha; not like the so called Shaivas who say that “Pasa baddha bhabet Jiva, Pasa mukta Sadashiva”. Their bhakti cannot be called as Bhakti, as by following so called bhakti, they climb over the head of Shiv and try to become Shiv themselves. Sheer non-sense. Dear brother……karma bhanbam means our early life action of good and bad things is called karma bhandam…..what is mean by kaarya bhandam…..please explain…. Karma is decided on overall actions we did in different situations. Karya is the deed of that particular moment. An impact or effect of both of these is bandhan which no one can escape as it revolves around our actions. Thanks for the feedback. Please read other posts, hope you find them enriching too. Thanks for your support. Please read other posts and provide your valuable feedback.